Born in 1948, in the foothills of northern Greece near Ioannina, Dimitrios Klitsas attended the Ioannina Technical School, where he received a formal, intensive education in classical design and wood carving techniques. Moving to Athens upon graduation, he apprenticed to the acclaimed master wood carver Evangelos Moshos for five years. He then opened his first shop in Athens and worked there for the following five years. In 1974, he emigrated to the United States. The maturation of his art represents a melding of his foundation in classical sculpture and the fulfillment of years of experience, growth and development. 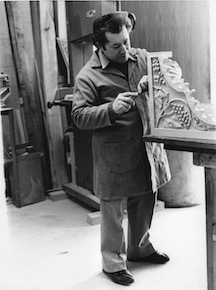 In 1994, Dimitrios was awarded the Arthur Ross Award from Classical America in recognition for ornamental woodwork chiefly in residences in the classical tradition. The Arthur Ross Awards are presented annually to a painter, sculptor, architect, landscape architect/gardener, architectural renderer, or craftsman whose mature work has exhibited a continued excellence and integrity in its application of classical ideals and canons. 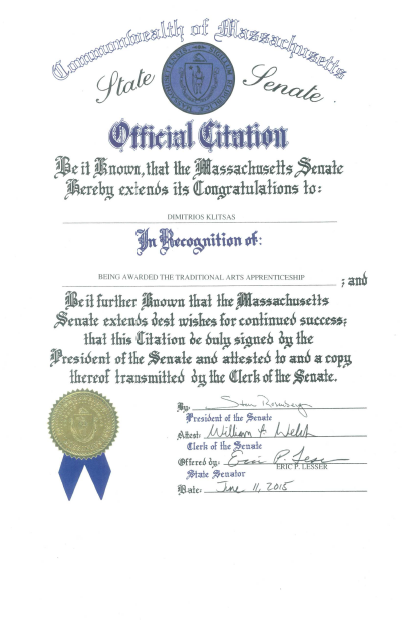 In 2015, Dimitrios also received an official citation from the Massachusetts State Senate for being awarded the Traditional Arts Apprenticeship by the Massachusetts Cultural Council. Click here to download and view Dimitrios Klitsas' brochure. See more of Dimitrios in the news.